Growing up all I ever wanted to do was catch for the Mets. We all want to be Hall of Fame players. We all want to win multiple World Series titles. For me, I probably would’ve been alright with just one inning. I would’ve settled for my Virgil Sweet moment. No one would have to know it was me. Just to go out there for one inning, lay down the signs, frame the pitch, and throw it back to the pitcher. Go out there and make a mound visit. Just go out there and get the very best out of my pitcher. After the last called strike, walk off the field shaking my hand in pain. No one had to know but me. I never did and never will get that chance. There are myriad of reasons why. However, despite what Bud Anderson once told me, I just wasn’t good enough. No, Saturday was the closest I was going to get. With Citi Field being re-sodded in the offseason, we couldn’t actually walk onto the field. With that in mind, I made my way over to the bullpens. 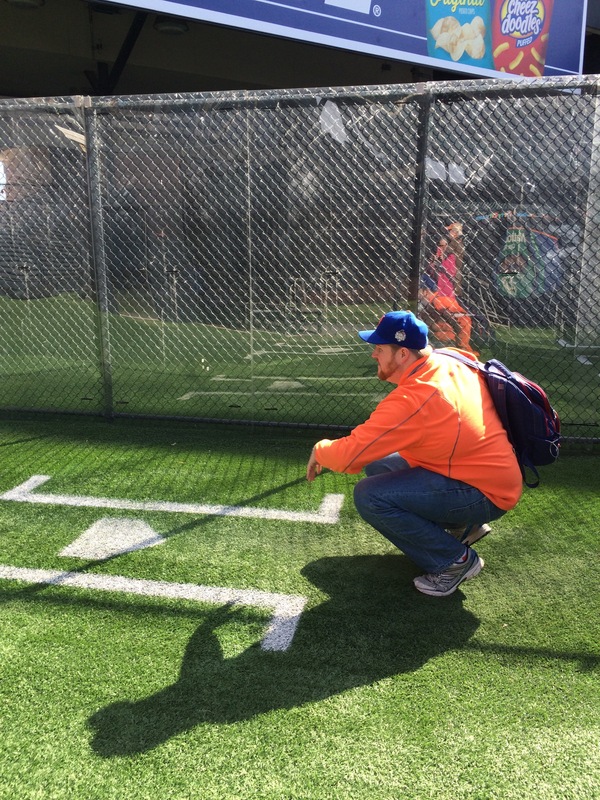 I found the spot where homeplate was drawn into the turf, and I did what came naturally. My banged up knees made their typical popping and cracking noises as I got down. I tried to get as low as my body would let me get now, partially torn Achillies and all. Instinctively, I put that ever so slight extra amount of weight onto my right leg. I did that because it helped me pop out of my squat and put a little extra on my throw to second. Once I got in that position, I stared out at the pitcher’s mound and soaked it all in. For that brief moment, my knees stopped hurting. My mind was clear. I was just taking it all in. I finally got my opportunity to get into a catcher’s squat in a major league stadium. During the tour, we took many pictures, but there was one I didn’t take. I never asked anyone to take a photo of me behind the plate. I was then reminded again why I have the best wife in the world. She saw me walk over and get down into my crouch. When she saw me “having my moment” as she put it, she made sure to take a few pictures. So on Saturday, I got to have my moment. It was probably the last time, I’ll ever have to experience that moment. However, there was another, more important moment. My wife showed me again how much she loves and understands me. Fortunately, Saturday won’t be the last time I get to have that experience.